The Greater Amberjack (Seriola dumerili) named “Porter Rico” (Tag ID: GFR6335) was originally tagged & released by angler James Brehm on December 22nd, 2015 while fishing with Captain Stan Saffan and mate Keith Delgado aboard the charter boat Therapy IV, out of Haulover Park Marina, in Miami Beach, Florida. The Amberjack was measured to be 47 inches (119.38 cm) total length and had an approximate weight of 40 pounds. The Greater Amberjack was recaptured 11 days later on January 1st, 2016 by angler Ty Gelman while fishing with Captain Mike Rodriquez and Mate Chris Matarazzo on the charter boat Therapy IV out of Haulover Park Marina, in Miami Beach, Florida. 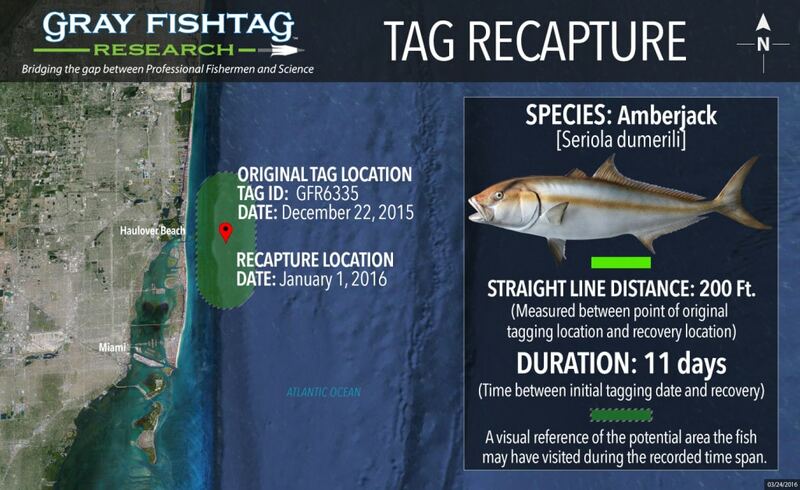 The recapture was in the waters off North Miami Beach, approximately 200 feet away from the original tag location. At the time of recapture, the Amberjack was measured at a length of 48 inches (121.92 cm) and weight of 40 pounds. During that 11 day time period, the Greater Amberjack most likely stayed in the local waters which is ideal habitat. They are often associated with rocky reefs and wrecks in waters ranging from 60-240 feet in depth. After the tag information was recorded, the Amberjack was re-tagged by the angler subsequently released healthy and unharmed. This tag recovery highlights the safe handling and responsible fishing practices that are exercised by the Therapy IV captain and crew members. This fish was tagged, recaptured, and subsequently tagged again by the same boat. The Therapy IV charter boat crew will receive some Gray FishTag gear for their tagging efforts. The angler Ty Gelman will receive a pair of Costa Del Mar sunglasses, a Tag & Recovery Certificate, and Gray FishTag gear for reporting the tag recovery.